DESCRIPTION: This flatware is from Hermann Göring's country estate at Carinhalle and was bought separate from the other Göring treasure groupings. The Reichsmarschal had literally dozens of sets of silver and thousands of individual pieces of Besteck (cutlery). He had been given sets made in France, England, and various German districts by friends and admirers too numerous to mention. You don't go out and buy an important man a side of beef, but how about tools to serve it and indulge? We have seen many different patterns of Göring silverware and all that they really have pretty much in common are the ever-present crest from the full coat of arms. Even this had some variance according to whoever the silver finisher was. 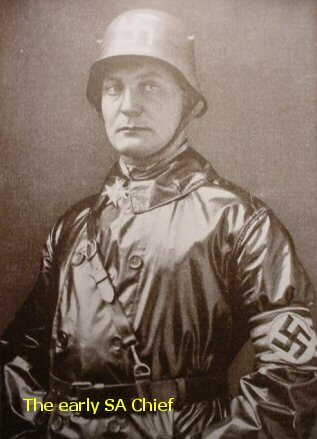 Although Adolf Hitler used Wellner and Brukmann, the Reichsmarschal was partial to others. 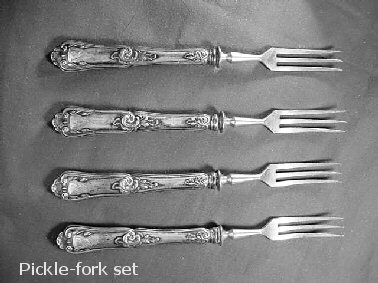 We present here four pickle forks from a formal set. 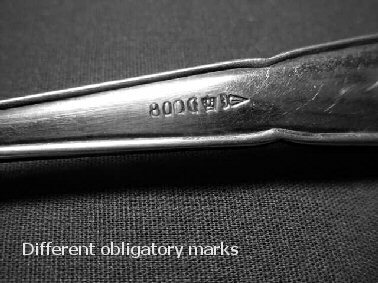 They are unsigned, but have the 800 silver marks at the end of the handle where it joins the stainless-steel tines. 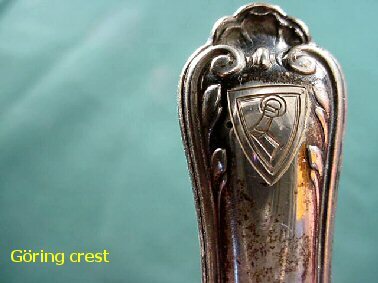 The petite instruments have the Göring crest neatly engraved at the ends of the fine rococo design. They are 6 ¼ inches long and Göringesque in their beauty. Sold as a set only! DESCRIPTION: This flatware is from Hermann Göring's country estate at Carinhalle and was bought separate from the other Göring treasure groupings. The Reichsmarschal had literally dozens of sets of silver and thousands of individual pieces of Besteck (cutlery). He had been given sets made in France, England, and various German districts by friends and admirers too numerous to mention. You don't go out and buy an important man a side of beef, but how about tools to serve it and indulge? We have seen many different patterns of Göring silverware and all that they really have pretty much in common are the ever-present crest from the full coat of arms. Even this had some variance according to whom the silver finisher was. 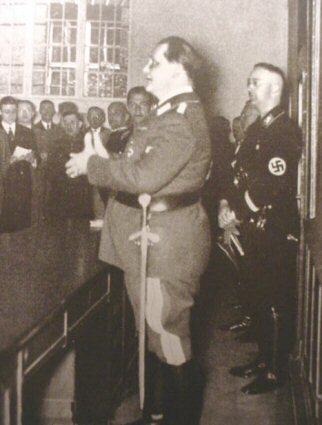 Although Adolf Hitler used Wellner and Brukmann, the Reichsmarschal was partial to others. 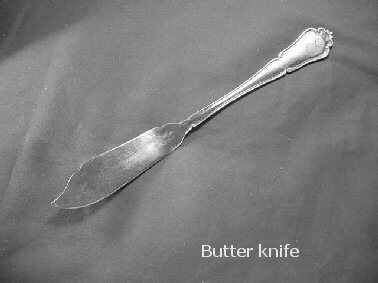 We present here a very rare butter knife; rare in the fact that there usually was only one of these to each six-piece place setting. This is an all-silver piece by Hülse. This firm was the main one doing the Reichsmarschal's flatware. This is from a formal setting with rococo design. It is plainly marked with the 800 silver designation beside the Hülse logo. 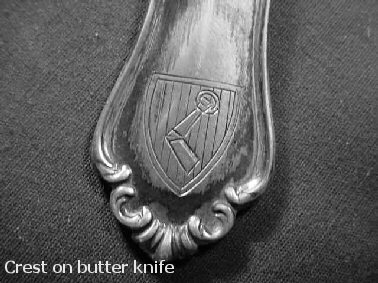 The Göring crest is finely presented at the pommel of the handle. It measures about 8 ½ inches long and is in fine condition. 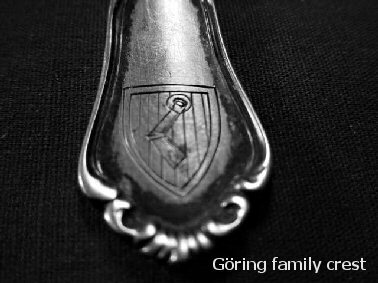 This is a classic Göring momento and not a very common piece of flatware at all! DESCRIPTION: This flatware is from Hermann Göring's country estate at Carinhalle and was bought separate from the other Göring treasure groupings. The Reichsmarschal had literally dozens of sets of silver and thousands of individual pieces of Besteck (cutlery). He had been given sets made in France, England, and various German districts by friends and admirers too numerous to mention. You don't go out and buy an important man a side of beef, but how about tools to serve it and indulge? We have seen many different patterns of Göring silverware and all that they really have pretty much in common are the ever-present crest from the full coat of arms. Even this had some variance according to whom the silver finisher was. Although Adolf Hitler used Wellner and Brukmann, the Reichsmarschal was partial to others. 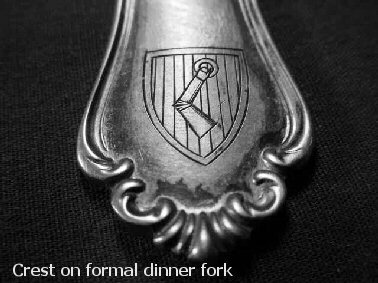 Here we present a formal dinner fork from the Hermann Göring flatware collection in Carinhalle. This is from the Hülse group; the company that made most of the Göring flatware and some of the tea and coffee sets. 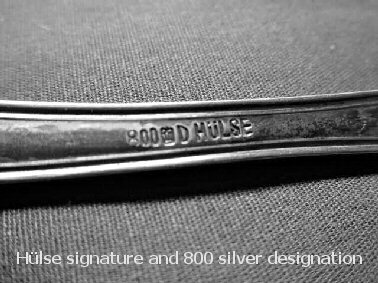 This fork is in the classic Hülse rococo design and beside the Hülse signature is the obligatory 800 silver designation mark. At the top of the handle is the Göring family crest. The fork measures 7 ½ inches and is quite heavy. 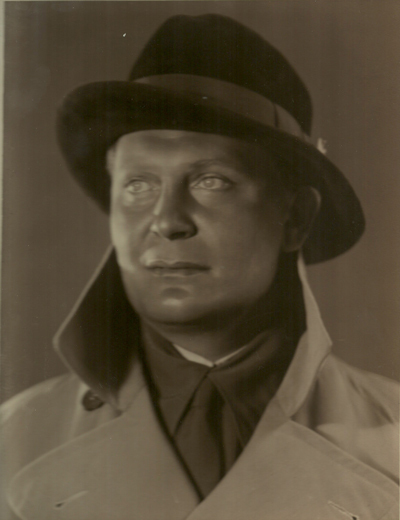 It is very classic in design and is a great Göring momento. DESCRIPTION: This flatware is from Hermann Göring's country estate at Carinhalle and was bought separate from the other Göring treasure groupings. The Reichsmarschal had literally dozens of sets of silver and thousands of individual pieces of Besteck (cutlery). He had been given sets made in France, England, and various German districts by friends and admirers too numerous to mention. You don't go out and buy an important man a side of beef, but how about tools to serve it and indulge? We have seen many different patterns of Göring silverware and all that they really have pretty much in common are the ever-present crest from the full coat of arms. Even this had some variance according to whom the silver finisher was. Although Adolf Hitler used Wellner and Brukmann, the Reichsmarschal was partial to others. 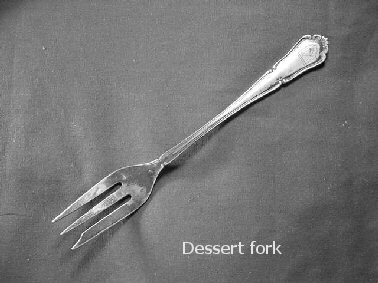 Here we present a dessert fork from the Hülse flatware grouping at Carinhalle. It has the Hülse signature and the crown and moon and 800 obligatory stampings. Although petite, it still has the full Göring family crest. 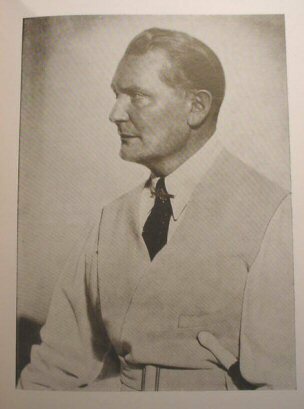 Hülse made most of Göring's flatware plus coffee sets and tea sets. We have also seen large silver and brass serving trays by this maker. It measures 6 inches long and is in fine condition (unpolished). 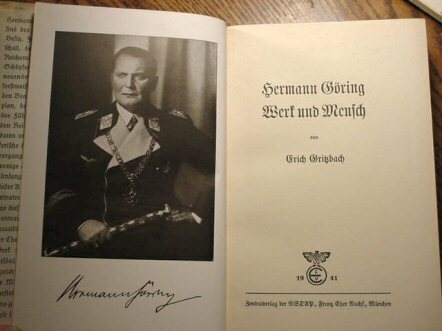 This is a rare and beautiful Göring momento. DESCRIPTION: This flatware is from Hermann Göring’s country estate at Carinhalle and was bought separate from the other Göring treasure groupings. The Reichsmarschal had literally dozens of sets of silver and thousands of individual pieces of Besteck (cutlery). He had been given sets made in France, England, and various German districts by friends and admirers too numerous to mention. You don’t go out and buy an important man a side of beef, but how about tools to serve it and indulge? 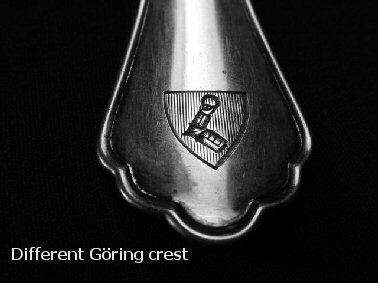 We have seen many different patterns of Göring silverware and all that they really have pretty much in common are the ever-present crest from the full coat of arms. Even this had some variance according to whom the silver finisher was. Although Adolf Hitler used Wellner and Brukmann, the Reichsmarschal was partial to others. 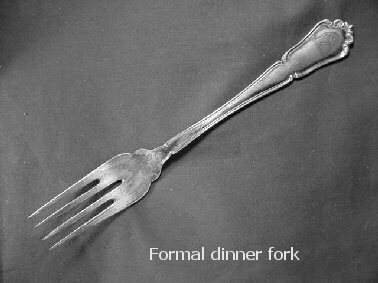 Here we present a luncheon fork from the Hülse grouping. 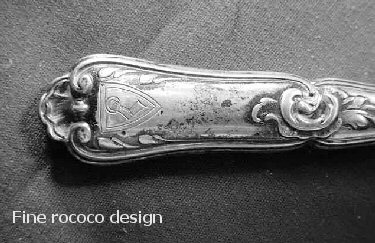 This company made most of Göring’s flatware in this fine classic rococo design. 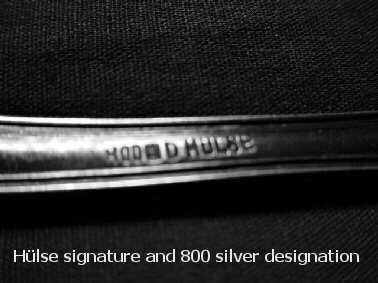 It has the Hülse signature with the crown, moon, and 800 obligatory silver designation mark, as well. 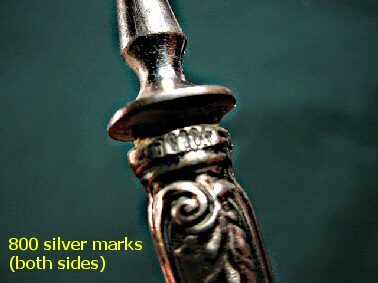 It measures 7 ¼ inches long and is all unpolished silver and heavy! 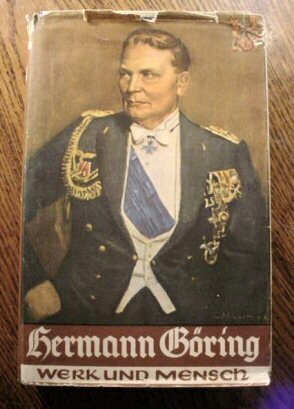 This is a fine H. Göring momento in fine condition. DESCRIPTION: This flatware is from Hermann Göring’s country estate at Carinhalle and was bought separate from the other Göring treasure groupings. The Reichsmarschal had literally dozens of sets of silver and thousands of individual pieces of Besteck (cutlery). He had been given sets made in France, England, and various German districts by friends and admirers too numerous to mention. You don’t go out and buy an important man a side of beef, but how about tools to serve it and indulge? We have seen many different patterns of Göring silverware and all that they really have pretty much in common are the ever-present crest from the full coat of arms. Even this had some variance according to whom the silver finisher was. 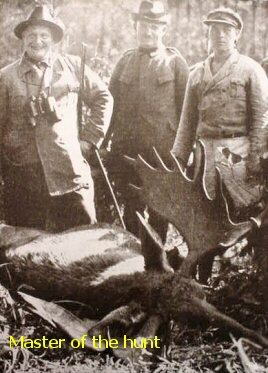 Although Adolf Hitler used Wellner and Brukmann, the Reichsmarschal was partial to others. 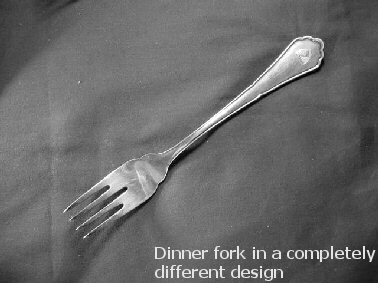 Here we have a fine example of a dinner fork in a completely different design and company, although unsigned and of a much more simple pattern than that of Hülse. It still has the moon, crown, and obligatory 800 mark. The design is quite simple, but having said that , it still is quite elegant in its simplicity. 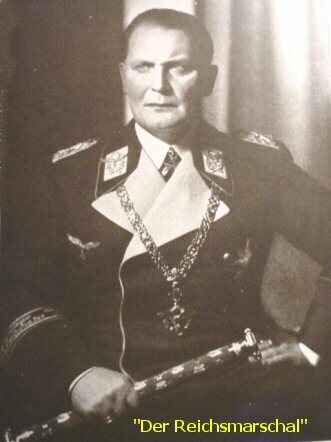 The Göring crest is smaller that as seen on Hülse pieces and doesn’t have the double framing around the armored arm with ring crest. It measures 6 ¾ inches long and is in excellent condition. 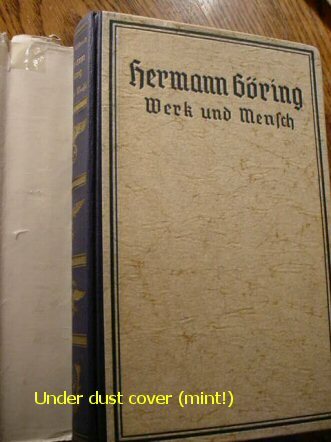 DESCRIPTION: This is the official biography (done during the period) of the human dynamo and Reichsmarschal Hermann Wilhelm Göring written by Erich Grissbach and published in 1941 under the auspices of the Central Printing Office of the NSDAP (Franz Eher Verlag) in Munich. It consists of 350 pages with over 50 pictures that are sharp and clear. 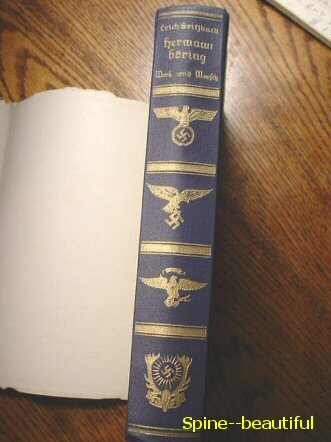 The book has the seldom-found color dust cover in pretty good shape, but the actual binding is in the deluxe edition with the symbols of his life’s work on the back strap. The book measures 8 ½ by 5 ½ inches and is 1 ½ inches thick. 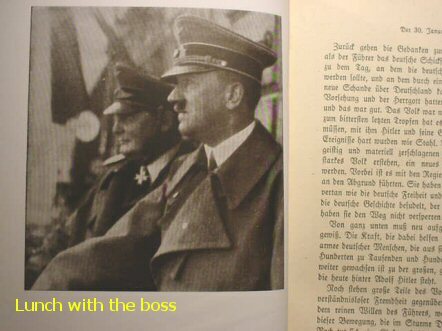 This is a very important book to the archives of National Socialism and the latter-day Falstaf Reich’s Marshall H. Göring.